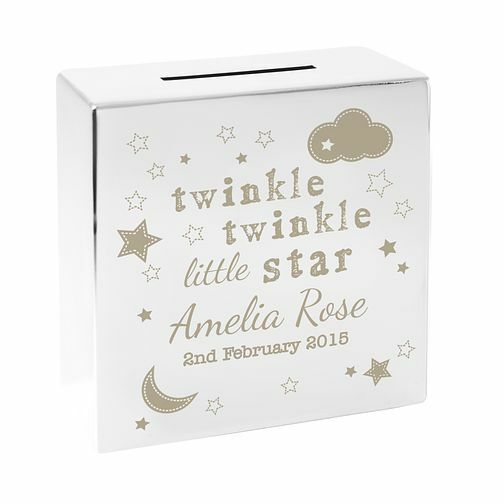 This beautiful silver finished moneybox can be expertly engraved with your own message below the adorable 'Twinkle Twinkle' motif. Perfect for births, naming days and first birthdays. Twinkle Twinkle Square Money Box is rated 3.5 out of 5 by 2. Rated 5 out of 5 by Anonymous from Beautiful Lovey moneybox, beautifully engraved and personalised. Maybe a little small if going to use a lot for lots of spare change. Feels like good quality and heavy too. Perfect for small hands as it won't break easily. Rated 2 out of 5 by Anonymous from Child's Money Box & Gift Wrapping as an "extra" Ordered a Childs Money Box online and paid extra for gift wrapping and a message. The money box was delivered within timescale and was fine. The problem was with the 'message' that I had requested to go with the gift wrapping. 3/4 of the message was missing and the remaining part made no sense at all !!. To be fair once I contacted customer services the problem was resolved (money refunded for message and gift wrapping and 25% off cost of money box) which was acceptable to me. However if I had sent this gift to its intended recipient without checking message if would have been very embarrassing to say the least.